Following yesterday’s publication of the US news, investors began to doubt the fact of recovery in American economy. Number of new jobs in private sector fell by 52 thousand. Leading indicator ADP suggests that Non-Farm Payrolls, which will become known on Friday, will decrease. On the other hand, American currency is supported by the US Fed decision to reduce quantitative easing program. 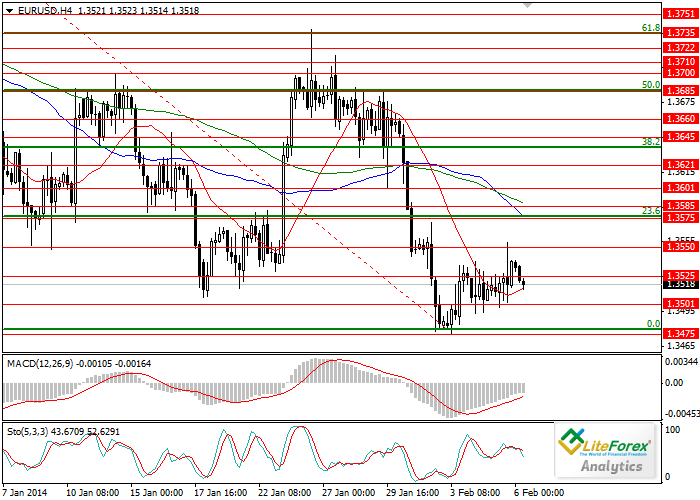 Yesterday, the pair EUR/USD traded near the level of 1.3500; however at the end of the day slightly rose above 1.3525. After the publication of NFPR, the pair is likely to correct upward and after that will continue downward movement. Among today’s news attention should be focused on interest rate decision of ECB and on press-conference by Mario Draghi. The nearest support levels are 1.3500 and 1.3475; the latter one is the key level for the “bears.” Resistance levels are 1.3525, 1.3550 and 1.3575. Prior to the opening of the American trading session the pair is likely to trade in the narrow range of .3500-1.3550. Further movement direction will be determined by the US news. Short positions can be opened below the level of 1.3475. Buy positions are recommended after breakdown of the level of 1.3575.